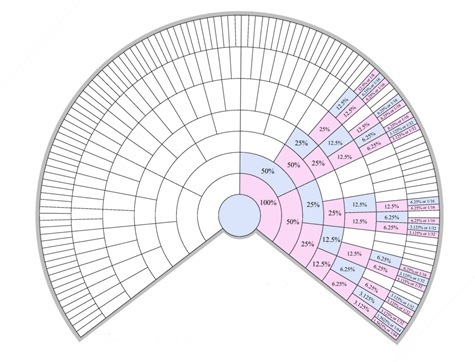 Last month I wrote “Unlocking the Genealogical Secrets of the X Chromosome” and posted a few charts that show the inheritance of the X-chromosome through 8 generations. I thought these charts might be helpful since inheritance of the X-chromosome can be difficult to understand without seeing it. Since posting the article, two new charts have been created using the originals. I made one, and the other was made by Rodney Jewett (who gave me permission to re-post the chart here) and posted at dna-forums.org. Note that Ann Turner also has a text file of the Ahnentafel numbers of those ancestors who potentially contributed to the X chromosome, through 10 generations. I’ve been very intrigued by all the recent discussion of the X-chromosome in the genetic genealogy context, and I’ve been exposed to some facts about the X-chromosome of which I previously was unaware. 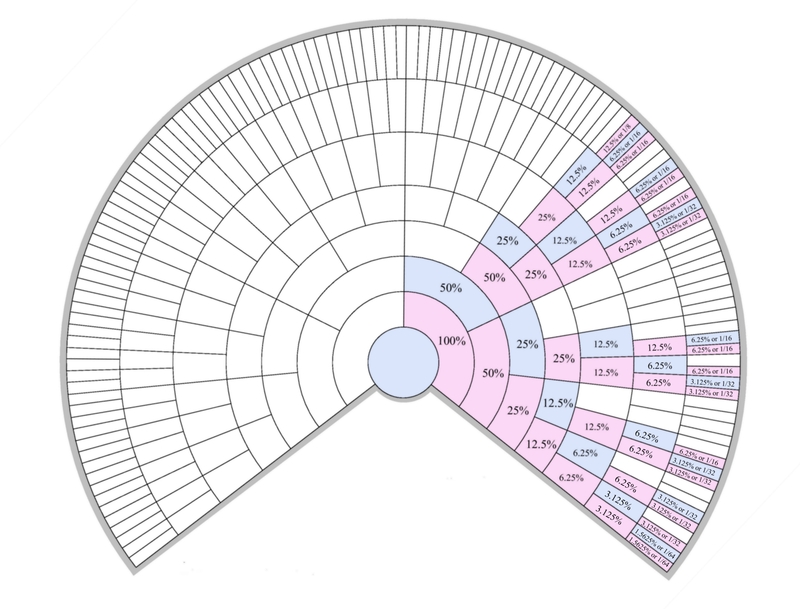 Thus, the chart shows that if you are a male, your mother’s father’s mother’s father’s mother’s father’s mother contributed 1/8th of your X-chromosome, while your mother’s mother’s mother’s mother’s mother’s mother’s parents only contributed 1/64th. Now, keep in mind that this chart serves only as a very rough guideline for inheritance. Although males pass the X chromosome largely unchanged to their daughters, females will usually pass a mixed X chromosome to their child a mixture of the X chromosome they received from their father and the X chromosome they received from their mother. However, a child is unlikely to receive an X chromosome from their mother that is 50% from their maternal grandfather and 50% from their maternal grandmother – it will most likely be some other more random amount between 0% and 100%. Thus, an ancestor is likely to be either under- or over-represented in an actual X chromosome. Please, if you find any errors in my chart, please feel free to email me and I’ll do my best to correct them. With the advent of affordable sequencing, I would love to see a study that examined X-chromosome inheritance in a family of 6 or 8 generations. How closely would it match the theoretical inheritance probabilities from the chart above? It’s probably just a matter of time before this research is conducted. P.S. – Feel free to use these charts, but please give proper credit. 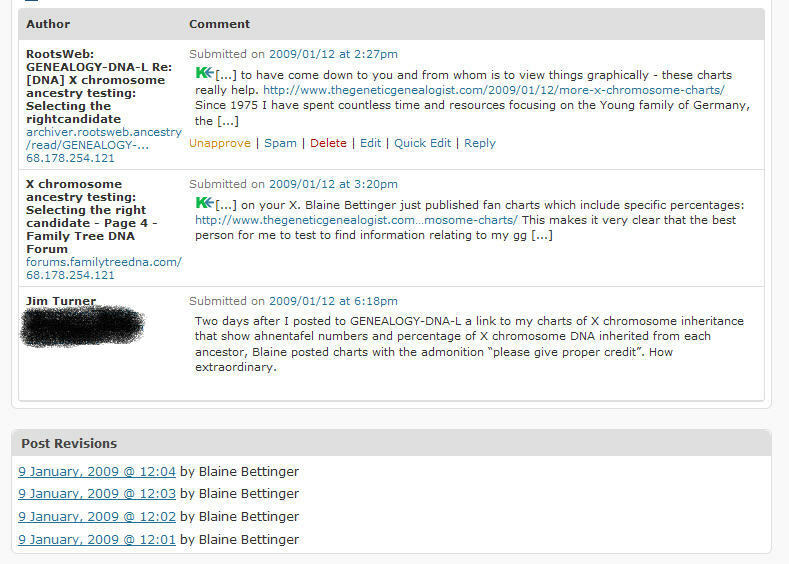 Two days after I posted to GENEALOGY-DNA-L a link to my charts of X chromosome inheritance that show ahnentafel numbers and percentage of X chromosome DNA inherited from each ancestor, Blaine posted charts with the admonition “please give proper credit”. How extraordinary. Jim – I assure you that it was pure coincidence. If I had seen your charts before I created mine, I would have included a link or asked your permission. For example, I obtained permission from Rodney Jewett before posting his chart here. If you click HERE, you’ll see that I uploaded this post on January 9th and set it for auto-post today. I know it’s not definitive proof, but I stand by my reputation in the genetic genealogy community. I do apologize for the coincidence, and I now wish I had posted my chart as soon as I created it last week. grandparents of 213)etc. could have left a substantial block of markers on a person’s X chromosome too. 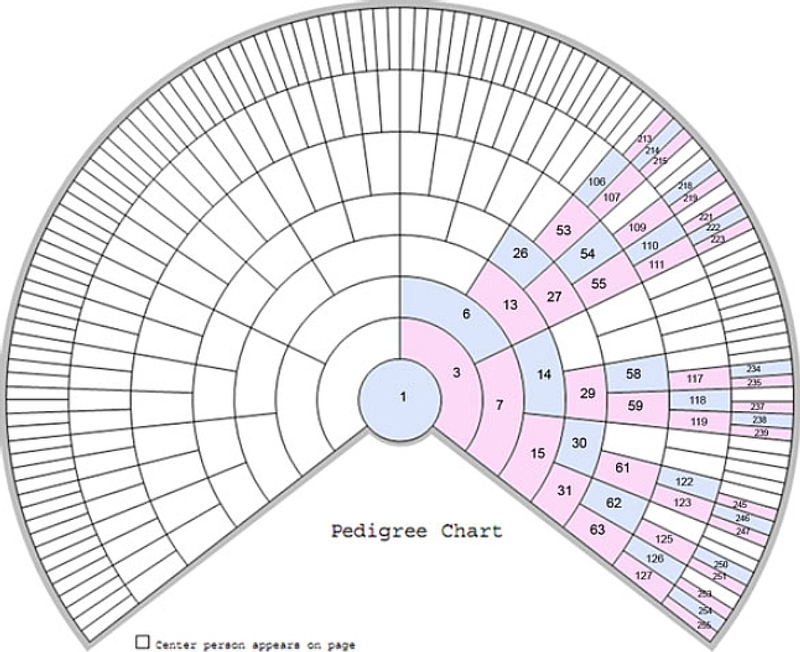 Maybe these X pedigree charts need to be extended out in some of the lines. Keep up the good work, Jim and Blaine. I have been doing literature searches for X chromosome inheritance and came across this site. Can we come up with some valid scientific reasons or importances as to why this type of research should be completed? My thoughts are to advance the health and welfare of humans and other organisms but what needs done specifically, where is the practical foundation for a study of this manner? How about a X descendant chart with percentages of the oldest couple? Let’s say 5 generations with each couple having one female and one male. To make it simple just trace the X of the Father.